A sumptuous selection of our fresh Leonidas Belgian chocolates, nestling like jewels in this very special gift box. 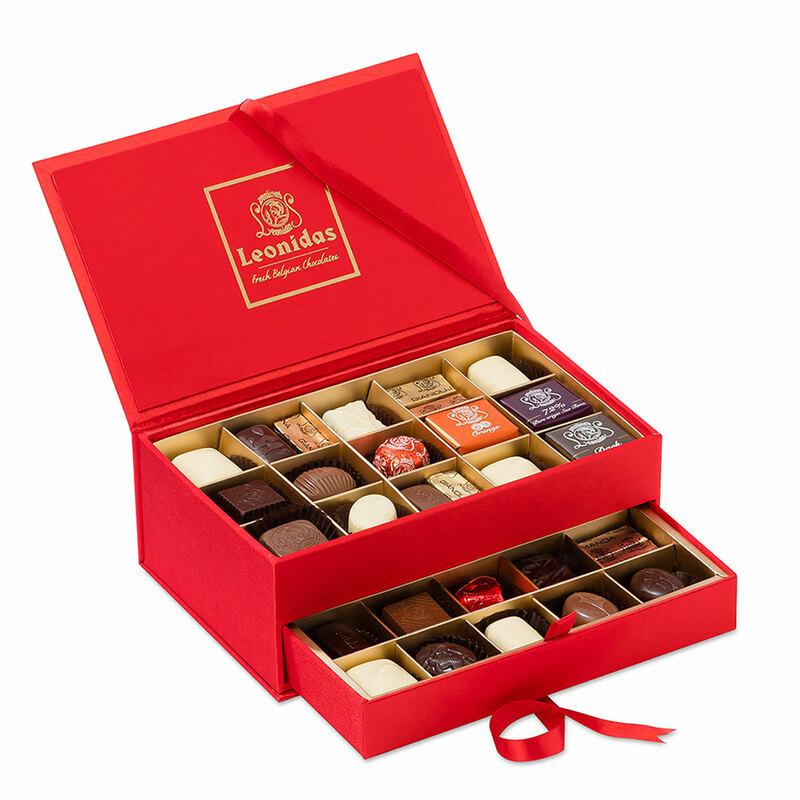 Discover some of our classic Leonidas favorites, such as creamy Gianduja, crunchy Casaleo, the Caramel d'Alexandre, and the Mosaique. 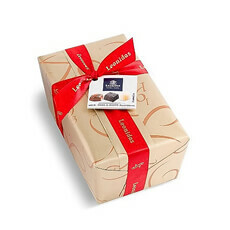 A wonderful gift of pure indulgence for your loved one, carefully chosen by the Leonidas Maitre Chocolatier. 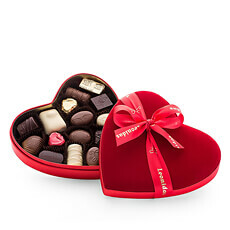 Presented in our stylish double-layer red jewelery box. Ingredients: Sugar, cocoa mass, cocoa butter, hazelnuts, whole milk powder, cream, butter, glucose syrup, humectant (sorbitol, xylitol), anhydrous butter, sweetened condensed milk, anhydrous milkfat, emulsifier (soya lecithin), puffed rice (gluten (wheat)), flavourings, biscuits ("feuilletine" speculoos) ((gluten) wheat, egg), fruits and concentrated fruit juices (orange, raspberry, cherry, mango, cranberries), inverted sugar, dextrose, almonds, almond milk (almonds, sugar, maltodextrin, soyabean, antioxidant (ascorbyl palmitate), anticaking agent (silicon oxide)), honey, elderberry powder, acidifier (citric acid, malic acid), colourings (curcumin, annatto), paprika extract, elderberry extract, carrot powder, coffee, pectin, invertase, glucose syrup -fructose, concentrates (grape, blueberry, carrot, currants), preservative (potassium sorbate), lactose, milk protein, salt, milk chocolate (cocoa solids min. 30%, milk solids min. 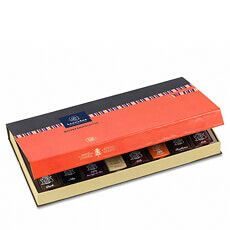 22%), dark chocolate (cocoa solids min. 54%), white chocolate (cocoa solids min. 25%, milk solids min. 22%).